This focus of this year’s IFE annual conference was ‘Fire Intelligence – International Analysis’. Held in Stratford upon Avon, the Head Office team welcomed both UK based and International delegates from countries such as Hong Kong, Singapore, Mauritius, Australia, New Zealand, Nigeria, the USA and Canada. During the AGM, the new International President, Neil Gibbins, was inaugurated and addressed the conference with thanks and humility. 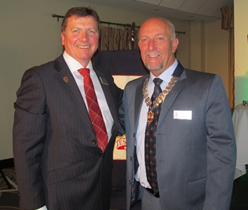 He thanked Grant Lupton, Immediate Past President, for his contributions during the previous year and then explained his plans for a very full year ahead. These included the development of the ‘Towards the Centenary’ IFE Strategic Plan, a full diary of visits to branches both in the UK and around the world, discussions with Special Interest Groups and consultations with members. Neil also explained that he sees a real opportunity for the IFE to harness knowledge gained and share it through new communications technologies in order to continue to highlight the distance fire engineering has travelled and share fire prevention technology. This will assist with driving down the risk from fire whilst supporting all of the IFE’s communities both in the UK and globally. Level 4 Cert: UK Winner. Candidate 53425 Mr Andrew Gausden from East Sussex. Level 3 Diploma: International Winner. Candidate 50782 Mr Jan Daniel Rossouw from South Africa. Level 3 Diploma: UK Winner. Candidate 51554 Mr Benjamin Walker from Staffordshire. Other keynote speakers included Peter Holland CBE QFSM FIFireE(Life) the UK Government Chief Fire and Rescue Advisor and Sir Ken Knight CBE QFSM FIFireE DL as well as representatives from the USA and Australia, Jim Crawford FIFireE and Dr David Launder respectively. Videos and notes from all speakers are available on our website: www.ife.org.uk. This event was supported by important industry specialists including Belimo, W L Gore, e-semble, Coopers Fire, Blackburn College, Godiva, Supply Plus, Pavilion Publishing, Prime Tech and The Fire Service College. The IFE is very grateful for their participation. The event finale was the International President’s Gala Dinner with Paul Fuller, CFO Bedfordshire FRS, and Andy Hickmott, CFO Warwickshire FRS, among the distinguished guests where over £1000 was raised for the Fire Fighters Charity.